EPU graciously hosted at least 100 friends and family members at their facility for the formal dedication of “The Family Room – Cholita’s Garden” today.While the rooms and halls of EPU were filled with memories, smiles and even a few tears, the mural, Bosque de los Suenos certainly took certain stage. If you were unable to attend the event today, you really have to plan a visit to EPU to view the mural — it is truly a visual experience. It’s hard to imagine how my mom would have reacted to all of the action today. Though I know that it would have made her very happy to see her sister’s art hanging alongside her own throughout the walls of a room filled with her family and friends. I felt so proud of her today, and grateful to know that she has this special room at EPU. 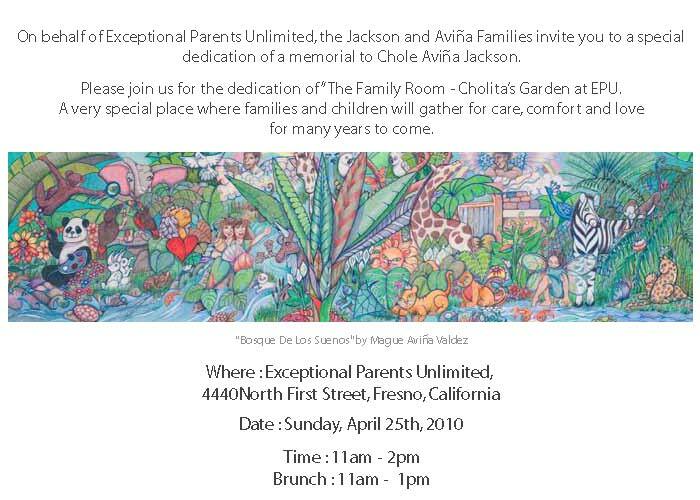 The dedication of the new “Family Room — Cholita’s Garden” will be held this Sunday from 11am until 2PM at EPU. Please drop by and say hi! We are planning to gather and enjoy the hospitality of EPU from 11am until 1PM, at which time the dedication will begin. Hope to see you there. EPU is located at 4440 North First Street in Fresno.